Bioluminescent reagent system for rapid quantitation of firelfy and Ranilla luciferase reporter gene expression in transfected cells. • High sensitivity and wide detection range: detection of as little of 2 fg luciferase. • Compatible with routine laboratory and HTS formats: assays can be performed in tubes or microplates, and measured with any luminometer. Can be readily automated on HTS liquid handling systems. • Fast and convenient: three step assay allows detection of dual luciferase levels within 20 minutes. The accuracy of reporter assays can be improved by utilizing a dual reporter system. One of the reporter genes is correlated with the promoter of interest and is used to assess the effects of specific experimental conditions, while the second reporter is used as a control and serves as a baseline response. 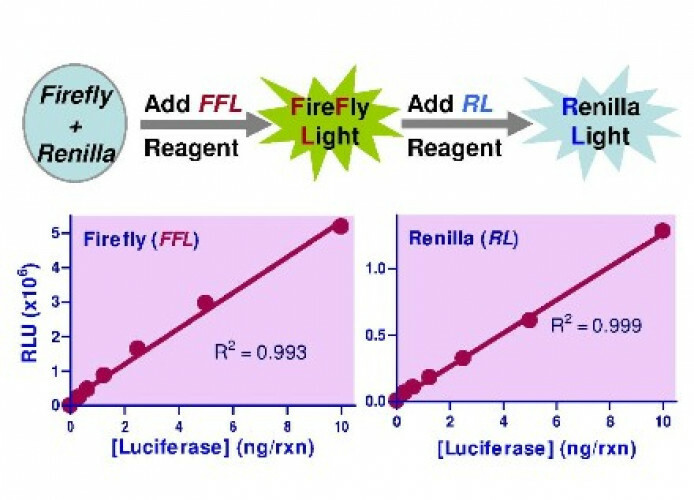 The SuperLight™ Dual-Luciferase Reporter Gene Assay allows for the sequential measurement of the activity of two different luciferases, firefly (FFL) and Renilla (RL), in a single sample. 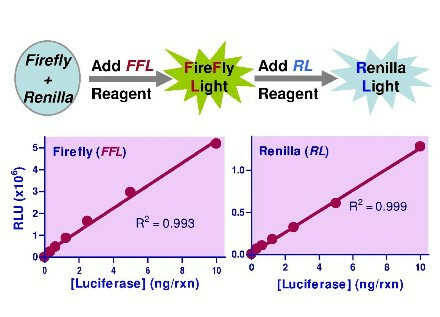 The firefly luciferase luminescence is measured first by addition of the FFL Reagent. Next, the RL Reagent is added to the same well. The RL Reagent simultaneously quenches the firefly luciferase luminescence and initiates the Renilla luciferase reaction. The light production of both reactions can be conveniently measured on a luminometer. This bioluminescent dual reporter gene assay is extremely sensitive and is especially suitable for quantifying dual luciferase expression in recombinant cells or in cell free transcription/translation reactions. Assays can be performed in tubes, cuvettes or multi-well plates. Applications Bioluminescent reagent system for rapid quantitation of firelfy and Ranilla luciferase reporter gene expression in transfected cells. References Assay: Plasma in Fish. (Pubmed). 1. Gabriel, FB et al (2015).Comprehensive biometric, biochemical and histopathological assessment of nutrient deficiencies in gilthead sea bream fed semi-purified diets. Br J Nutr. 114(5):713-26. Assay: Plasma in Fish. (Pubmed).